The Turks call it “Yerebatan Sarayi” which means underground palace. It is open to visit in summer between 9am and 6.30pm, in winter between 9am and 5.30pm. 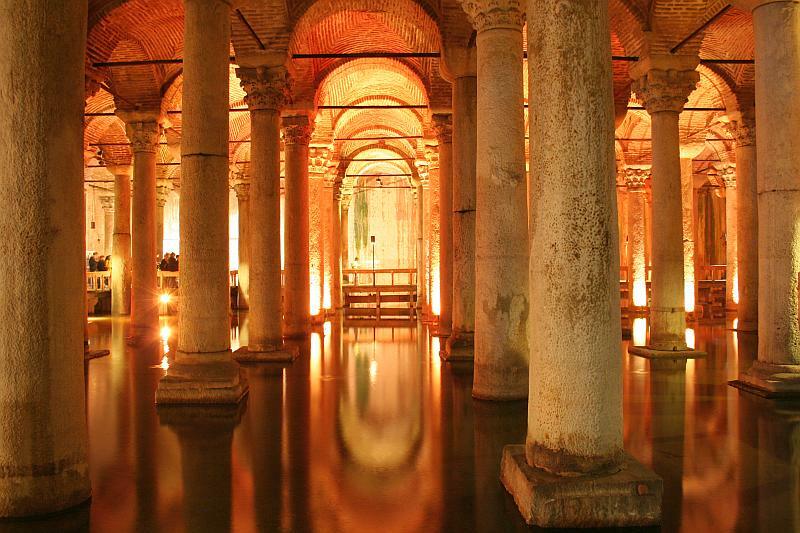 It is one of the most popular tourist attractions and the largest surviving Byzantine cistern in Istanbul. It’s a great place to pass the time 30-45 minutes, especially during hot summer when its cavernous depths stay wonderfully cool. The underground Cistern’s symmetry and sheer grandeur of conception are quite extraordinary. It is located near the Hagia Sophia Church in the Sultanahmet district. It was built in 532 century, during the reign of Justinian, to supply water to the Great palace complex nearby and surrounding buildings and during the Ottoman Period, the water was again used for Topkapi Palace and watering the gardens of it. Water was delivered via 20km of aqueduct from a reservoir near the Black Sea. There are many pipes at different levels in the eastern wall and water used to be distributed through these pipes. The cistern is cleaned and renovated in 1985 a wooden walkway between the columns was built and opened to visit in 1987. It is 140 meters long and 70 meters wide and supported by 336 beautiful columns. Don’t miss the 2 beautiful columns which no one knows where these columns came from, in the cistern supported by blocks carved into Medusa heads and the one towards the centre featuring a teardrop design. You can have a cup of coffee in the small cafe which is unusual spot to enjoy near the exit. Elegant spotlighting makes the water shimmer with coloured dancing lights and also you can enjoy classical background music and watching fishes swimming in the water. You can also throw a coin and make a wish like all locals do. It is also hosting many Classical Music Concerts.